On November 15, Gyan Dev Ahuja walked into the Rajasthan BJP headquarters in Jaipur along with a few men. Missing was the usual twirl in his distinctive handlebar moustache, and the clamour of party men to greet him. The previous day the BJP had denied Ahuja, the legislator from Ramgarh constituency in Alwar district, a ticket for the assembly elections. And the hindutva stalwart did not take it well. “I have come here to meet party leaders, and will later reveal my plan of action,” he said. In the keenly contested Rajasthan elections, the BJP dropped a hint or two about its strategy when not a single Muslim candidate figured in its first four lists. In 2013, the party had fielded four Muslims. Two of them won and one, Yunus Khan, became a minister. This time, many political observers said, the BJP was keen on playing the hindutva card like it successfully did in Uttar Pradesh. But the denial of tickets to Ahuja and Banwari Lal Singhal, another hindutva proponent and legislator from Alwar Urban, has caused some confusion. A source in the party said that it could be on Chief Minister Vasundhara Raje’s insistence that they were dropped as both had been critical of her. Union minister of state Gajendra Singh Shekhawat and BJP joint secretary V. Satish, who is on deputation from the RSS, had camped in Jaipur to iron out the differences between Raje and the central leadership over distribution of tickets. The BJP dropped 45 of its MLAs, including half a dozen ministers, even though Raje managed to get tickets for most of her loyalists. Rebels can make the contest even more difficult for the BJP, which is fighting a strong anti-incumbency wave against the Raje government. In both the BJP and the Congress, the candidate selection went down to the wire, as many names were revealed just hours ahead of the deadline of nomination. Both the parties struggled to balance caste equations and please key leaders. Protests were held at Congress offices in Delhi and Jaipur by supporters of those who were ignored by the party. The Congress has fielded both state party chief Sachin Pilot and former chief minister Ashok Gehlot. This strategy has made it sure that all factions in the party put in their best to win the polls. If Pilot had galvanised the party in the past four years, veteran Gehlot has a massive recall value across the state. Most of Gehlot loyalists got tickets, and Pilot could manage a few for younger and new candidates. Gehlot will contest from Sardarpura in Jodhpur, the only seat the Congress won in the region in 2013. Senior leaders C.P. Joshi and Girija Vyas are also contesting the elections. In a master stroke, the Congress has pitted former BJP man Manvendra Singh against Raje from the Jhalrapatan constituency. Former Union minister Jaswant Singh’s son, Manvendra resigned from the BJP citing humiliation to his father and Rajputs, and joined the Congress in October. Jaswant was denied a BJP ticket in the 2014 Lok Sabha elections and he contested as an independent candidate but lost. The Congress’s game plan seems to be to tie down Raje in the constituency, which has sizeable Rajput and Muslim populations. The BJP responded in kind. On the last day of filing the nominations, it replaced legislator Ajit Mehta with minister Yunus Khan in the Tonk constituency against Pilot. Tonk has a significant presence of Gurjars (Pilot’s caste), Muslims and dalits. In the past four decades the Congress had fielded only Muslims from the seat. Mehta had been facing problems within the party. “There is resentment. The MLA’s attitude towards locals, other legislators and the MP has not been cordial. I have apprised the party,” said Sukhbir Singh Jaunapuria, who represents the Tonk-Sawai Madhopur Lok Sabha constituency. Khan is the only Muslim candidate from the BJP. The Congress has fielded 15 Muslims. The BJP is worried that it has not been able to communicate to people about the welfare schemes floated by Raje. Shah even admitted this at a rally when he said Raje had not been able to present all the good work she did. 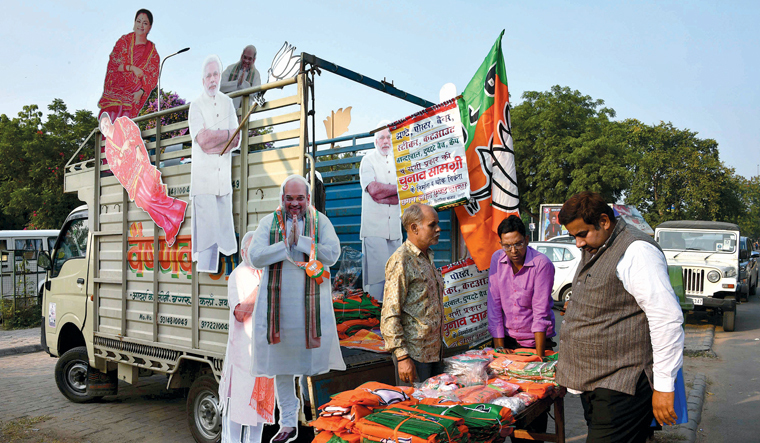 As the polling day nears, Prime Minister Narendra Modi, Shah and Uttar Pradesh Chief Minister Yogi Adityanath will bombard the desert state with rallies. Modi still draws crowds in Rajasthan. The RSS, too, has been focusing on the state and had held several big gatherings here in the past few years, including two annual meetings. Their combined strength seems to be the BJP’s biggest hope.